India is a land of diversity and culture. All its veracity and past has remained intact in the heritage that India still holds. We make sure that you do not just go about the Indian streets, markets and landmarks without knowing the actuality and the significance of it. 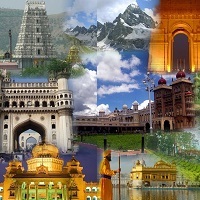 Performing from Ahmadabad, Gujarat, Hindustan Tourism Service offers the best-in-class Domestic Tours for all of India. Our team of adept organizers and planners has strategically designed packages for Beach Island Tours, Pilgrimage /religious Tours, Heritage & Culture Tours, Honeymoons, Hill Station Tours, and Yoga & Ayurveda Tours which are inclusive of accommodation and commuting. We have priced all our services absolutely reasonably so contact us without hesitation. We can also be contacted for customization of these services according to your dates, interests and budget.